Edited by Irena Bekić, Ivana Franke. Texts Ida Momennejad and Ivana Franke. Published by Zagreb City Libraries. 2012. 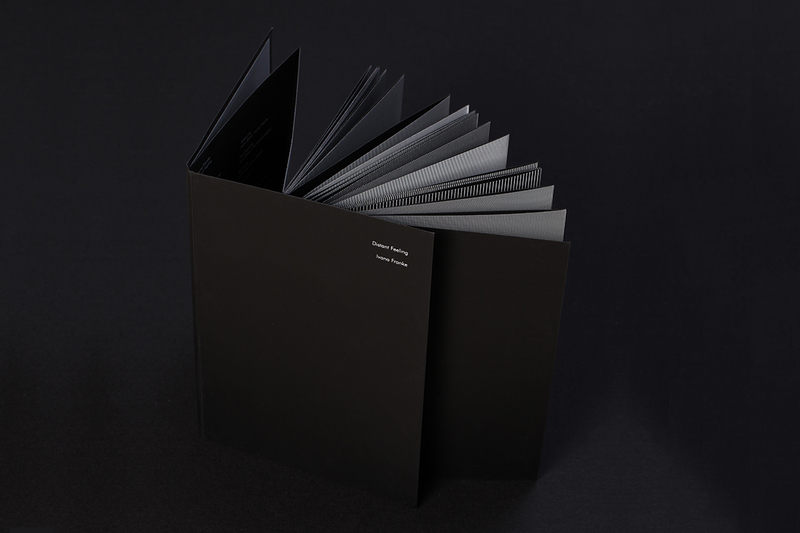 Artist book. 80 pages, silkscreen on paper 14.7 x 21 cm. Ed. 40. Frequency of rectangular wave gratings: 12 - 50 cpd, the length 560 cm. Duty cycle (r) 0.2 mm, the width of one cycle 28 mm. 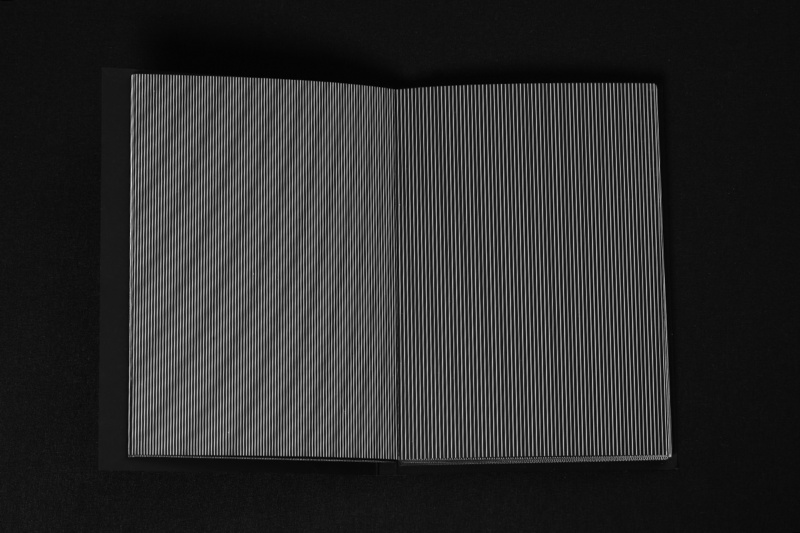 Black and white striped pattern drawing in the artist book Distant Feeling is direct translation of flashing light sequence used in the installation Seeing with Eyes Closed. In Seeing with Eyes Closed simultaneously illuminating LED lights are programmed to flicker at a frequency between 12 and 50 hertz for a duration of 3 minutes and 18 seconds. Flash duration of 6 milliseconds is constant while pause duration varies. The visitors are invited to sit on the floor in front of the object and close their eyes. They are exposed to flashing light which produces quasi-hallucinatory visual experience of flowing images behind closed eyes. In the Artist book Distant Feeling the temporal frequencies of flashing light which were used in Seeing with Eyes Closed are “translated” into the spatial frequencies of the rectangular wave gratings in a range between 12 and 50 cycles per degree, troughout the length of 560 cm. Duty cycle is 0.2 mm, and width of a cycle is 28 mm. 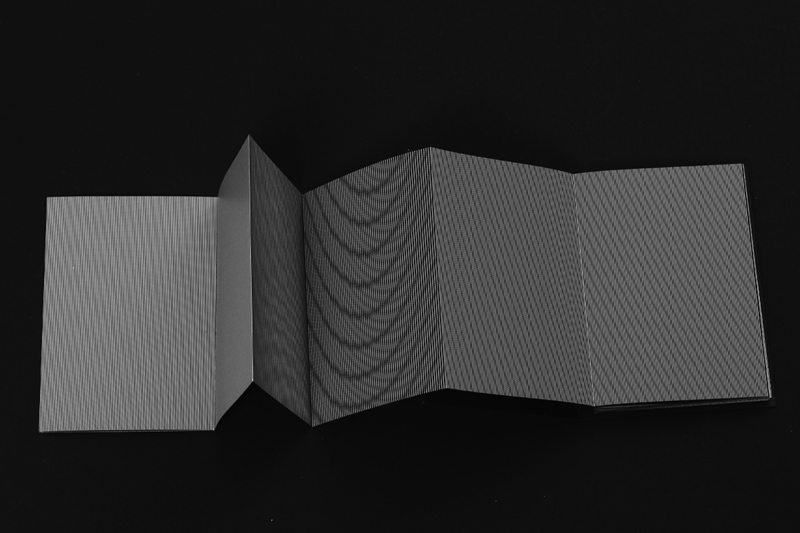 The visitors are invited to read each page for 5 seconds which produces appearance of illusory moiré-like patterns. These different visual stimuli used in Seeing with Eyes Closed and Distant Feeling (flashing light and black and white stripes) which have certain physical characteristics in common give rise to somewhat similart conscious experience of seeing images in a place which doesn’t coincide with their physical location. This raises a question if there is some similarity in the waves of activity which they induce in the cortex and how these cortical rhythms translate into seeing images where they seem to be.